Pat Chambers: We played a great 20 minutes. It's a 40 minute game ... We have to keep working together. Chambers: When they were making shots, we couldn't get out in run. We had transition in the 1st half, didn't have any in the 2nd. Chambers: They just exploited our weaknesses in the second half. #Badgers shot 39.3% in first half and 55.6% in second. That kept PSU from getting in transition. UW set defense. #Badgers Hayes' stat line: 9 points, 8 rebounds, 4 assists, 2 steals. Brown said Penn State's offense frustrated UW's defense in 1st half, mainly because the Badgers were struggling in transition. According to #Badgers : PSU with 13 transition points in first half. Second half? Zero. Gard admitted he wasn't very happy in the 1st half. Said the group responded and the group did a good job of addressing the issues. Really hope BTN caught #Badgers Gard in the team huddle after he called that timeout in first half. He was livid. #Badgers Gard thought Iverson diving on the floor for steal -- after the dunk -- was huge spark for the sophomore. 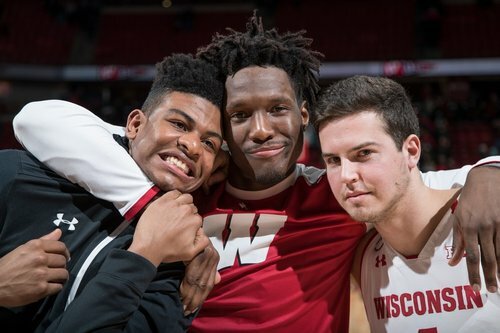 UW dominated the glass ???? OK, tweeps. I just filed the final version of the #Badgers story. Will tweet out link in a few.